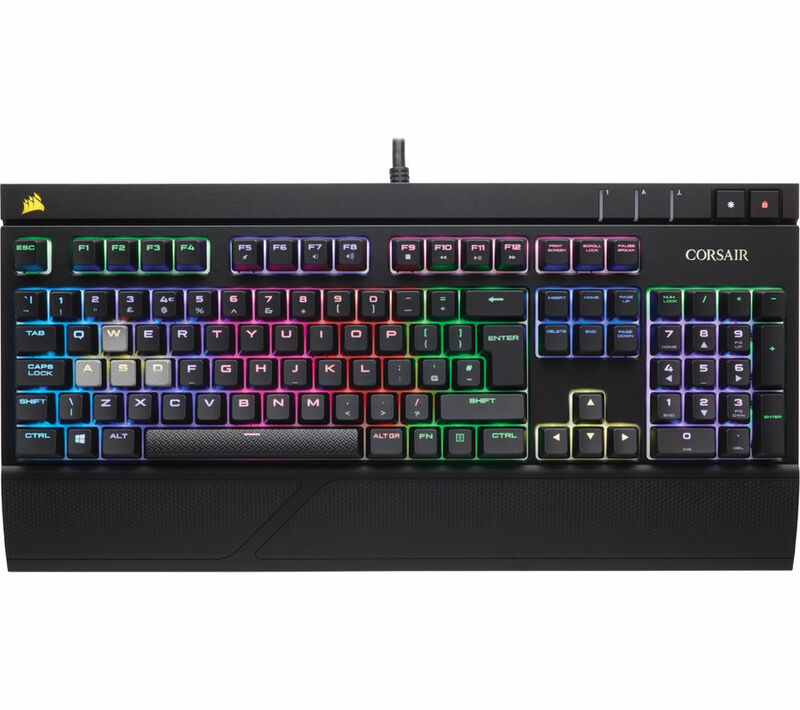 Take your PC gaming experience to the next level with the Corsair STRAFE Mechanical Gaming Keyboard. Featuring Cherry MX Silent RGB key switches, the STRAFE ensures that you benefit from the ultimate competitive advantage. The mechanical keys are designed to be responsive to your commands to assist your gaming experience, allowing you to perfectly execute double and triple taps with no audible click or tactile "bump". You can even switch to the included FPS and MOBA keycap sets depending on your preference - the textured and contoured keycaps offer maximum grip and an enhanced feel to help you immerse yourself in the game. 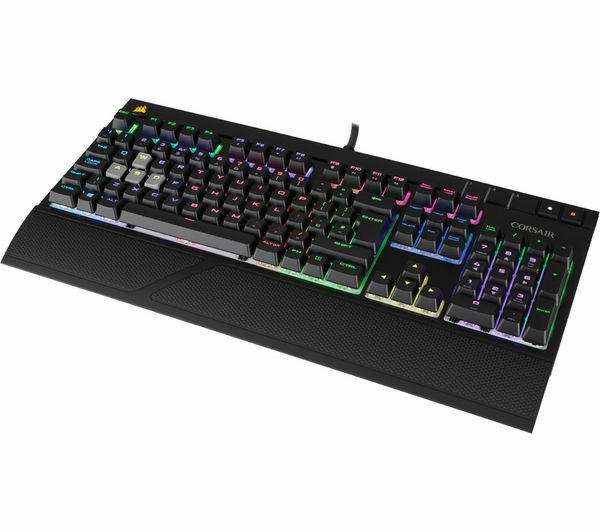 The keyboard also boasts 100% anti-ghosting, with 104 key rollover on USB to ensure no matter how fast you play, all of the keys register to allow you to deliver instructions at your pace. With a USB Pass-Through Port, you can enjoy uninterrupted game play. It's instantly ready for your mouse, wireless headset adapter or phone, depending on what you need it for. With dynamic RGB backlighting, your gaming experience is enhanced with virtually unlimited lighting adjustability so you can find the perfect set up. The STRAFE is fully programmable, allowing you to reassign any key or set up the most extreme macros for effortless gaming. Now you can feel in total control, choosing your ideal configuration so that all of your focus can be dedicated to the game itself. With the easy-access multimedia controls, you can efficiently adjust volume on the fly to suit your mood. 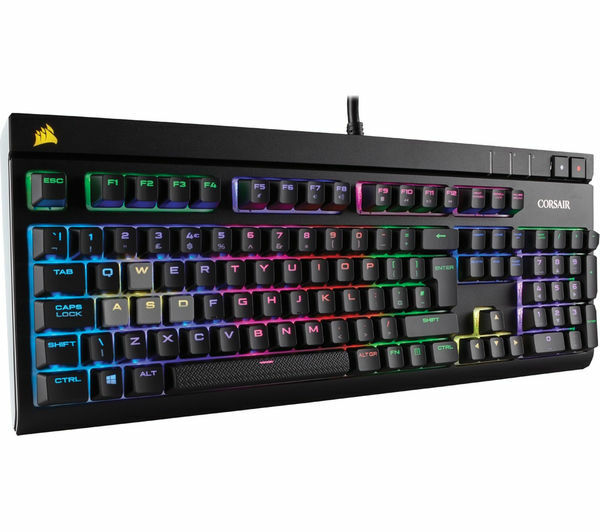 If you are looking to add to your PC gaming set up, the Corsair STRAFE Mechanical Gaming Keyboard is an ideal choice regardless of your experience.